Congratulations! Your brakes failed last night. Fabricate your own hard line, or you'll miss Christmas. My buddy recently purchased an XJ Cherokee to save himself from his horrendously unreliably 250K mile E36 stance project. So of course, he experienced catastrophic failure within 2 days of owning the car. A rusted out hard line burst, leaving him stranded on Christmas eve. Finding a pre-bent hard line was out of the question. Our local Jeep dealerships didn’t have any in stock, and even if they did, installing it would have been extremely difficult due to the hard line’s location. It’s clipped to the firewall behind the ancient wiring harness rat’s nest. That said, the line that broke operated the front passenger side caliper, so everything we needed to replace was in the engine bay, which was fortunate. The flaring tool kit was a cool purchase, but it wasn’t perfect. The flares it created were too large, so we couldn’t reattach the line to the underside of the combination valve. Bonus: since we couldn’t see what was going on, it took my friend ~20 minutes of fiddling before he realized why it wasn’t threading. The solution? Try to salvage the combination valve side of the original line because it had a flare we could use. That section was free of corrosion, so we threw a connector on one end, and threaded it in instantaneously. 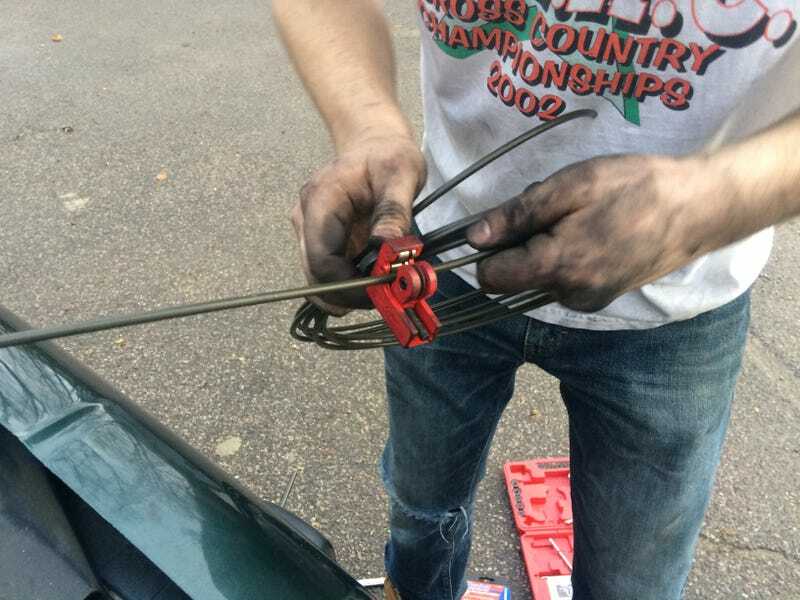 After that, roadkill style brake line fabrication ensued. This fix didn’t have to be pretty. It was Christmas Eve, and that Jeep needed to make it to his parents’ house on time. His brother needed a ride because he’s addicted to motorcycles and therefore doesn’t own a car. Oh, and there were the presents too, including a massive grill for their dad that wasn’t going anywhere without the Jeep. Here’s the finished product. It’s the conspicuously wavy pipe meandering gracefully over the valve cover at the top of the frame, below the wiring harness. Not a perfect fix, but it worked! We bled the brakes to the best of our ability (two of the bleed screws were being uncooperative), and my friend tested the system via slamming on the brakes in his driveway a few times. That’s good enough, right? Christmas was saved! My buddy, his biker bro, and their stash of presents made it to their parents’ house at 8:30 PM after a solid 6 hours of wrenching. Naturally, car guys tend to get pretty stressed out when this kind of thing happens. But we don’t freeze like a deer in the headlights and order a Zipcar. We persevere because we understand that no matter how daunting a situation seems, you shouldn’t give up until you’ve exhausted all of your options. And that, my friends, is one of the most valuable lessons you can learn from working on cars.